Hoping to get behind the wheel of an INFINITI SUV but need to stick to a budget? Choosing one of our high-quality used models might be the right option for you! When you opt for a used INFINITI SUV, you’ll still enjoy plenty of technology features and interior amenities without having to pay the full sticker price. Make the trip to our showroom today to see our vehicles in person! 3.133 Axle Ratio, 4-Wheel Disc Brakes, 6 Speakers, ABS brakes, Advanced Climate Control System, Air Conditioning, Alloy wheels, Aluminum Roof Rails, AM/FM radio: SiriusXM, Anti-whiplash front head restraints, Around View Monitor (AVM), Auto-Dimming Inside Mirror, Automatic temperature control, Block heater, Bose 11-Speaker Premium Audio System, Brake assist, Bumpers: body-color, CD player, Delay-off headlights, Driver door bin, Driver vanity mirror, Dual front impact airbags, Dual front side impact airbags, Dual Occupant Memory System For Driver's Seat, Electronic Stability Control, Four wheel independent suspension, Front anti-roll bar, Front Bucket Seats, Front Center Armrest, Front dual zone A/C, Front fog lights, Front reading lights, Heated door mirrors, Heated Front Bucket Seats, Heated front seats, HomeLink Universal Transceiver, Illuminated entry, Independent Front & Rear Multi-Link Suspension, INFINITI Navigation System, Leather Appointed Seat Trim, Leather Shift Knob, Leather steering wheel, Low tire pressure warning, Maple Interior Accents, Occupant sensing airbag, Outside Mirrors w/Reverse Tilt-Down Feature, Outside temperature display, Overhead airbag, Overhead console, Panic alarm, Passenger door bin, Passenger vanity mirror, Power door mirrors, Power driver seat, Power moonroof, Power passenger seat, Power steering, Power Tilt & Telescopic Steering Column, Power windows, Premium Package, Premium Plus Package, Radio data system, Radio: AM/FM/CD w/6 Speaker Audio System, Radio: AM/FM/CD/DVD w/MP3 Playback Capability, Rear anti-roll bar, Rear reading lights, Rear seat center armrest, Rear window defroster, Rear window wiper, Remote keyless entry, Security system, Speed control, Speed-sensing steering, Speed-Sensitive Wipers, Split folding rear seat, Spoiler, Steering wheel mounted audio controls, Streaming Audio via Bluetooth Wireless Technology, Tachometer, Telescoping steering wheel, Tilt steering wheel, Traction control, Trip computer, Turn signal indicator mirrors, Variably intermittent wipers. CARFAX One-Owner. Clean CARFAX. Certified. INFINITI Certified Pre-Owned Details: * Limited Warranty: 72 Month/Unlimited Mile (whichever comes first) Limited Warranty 72 months/Unlimited miles from original in-service date for vehicles over 15,000 miles & under 2 years old, 24 months/Unlimited miles from certified purchase date for vehicles over 15,000 miles & older than 2 years * Roadside Assistance * Transferable Warranty * Vehicle History * Warranty Deductible: $0 * Includes Rental Car and Trip Interruption Reimbursement * 167 Point Inspection INFINITI of Boerne has been honored as one of the elite INFINITI retailers in the United States earning the Circle of Excellence Award. This prestigious award is granted to less than ten percent of all INFINITI retailers for their outstanding customer service and performance. View Our Story (https://youtu.be/pefb6aU3Hww) and see why INFINITI of Boerne stands out from the rest of the competition. 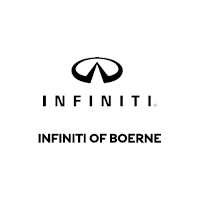 Visit INFINITI of Boerne today or contact us at 210-201-0311 to schedule a test drive. Free Car Washes For Life!, Acoustical Package, Alloy Wheels, 3rd row seats: bench, 4-Wheel Disc Brakes, 5.17 Axle Ratio, 6 Speakers, ABS brakes, Air Conditioning, Alloy wheels, AM/FM radio: SiriusXM, AM/FM/CD/MP3 Audio System, Auto-dimming Rear-View mirror, Automatic temperature control, Bodyside moldings, Brake assist, Bumpers: body-color, Cargo Package, CD player, Delay-off headlights, Driver door bin, Driver vanity mirror, Dual front impact airbags, Dual front side impact airbags, Electronic Stability Control, First Aid Kit, Four wheel independent suspension, Front anti-roll bar, Front Bucket Seats, Front Center Armrest w/Storage, Front dual zone A/C, Front fog lights, Front reading lights, Fully automatic headlights, Garage door transmitter, Heated door mirrors, Heated Front Seats, Heated front seats, High intensity discharge headlights: Bi-Xenon, Illuminated entry, Leather Shift Knob, Leather steering wheel, Leather-Appointed Seats, Low tire pressure warning, MP3 decoder, Occupant sensing airbag, Outside temperature display, Overhead airbag, Overhead console, Panic alarm, Passenger door bin, Passenger vanity mirror, Power door mirrors, Power driver seat, Power Liftgate, Power moonroof, Power passenger seat, Power steering, Power windows, Radio data system, Rear air conditioning, Rear anti-roll bar, Rear Cargo Protector, Rear reading lights, Rear seat center armrest, Rear window defroster, Rear window wiper, Reclining 3rd row seat, Remote keyless entry, Security system, Speed control, Speed-sensing steering, Speed-Sensitive Wipers, Split folding rear seat, Spoiler, Steering wheel mounted audio controls, Tachometer, Telescoping steering wheel, Tilt steering wheel, Tonneau Cover, Traction control, Trip computer, Variably intermittent wipers. Priced below KBB Fair Purchase Price! CARFAX One-Owner. Clean CARFAX. Certified. INFINITI Certified Pre-Owned Details: * Roadside Assistance * 167 Point Inspection * Limited Warranty: 72 Month/Unlimited Mile (whichever comes first) Limited Warranty 72 months/Unlimited miles from original in-service date for vehicles over 15,000 miles & under 2 years old, 24 months/Unlimited miles from certified purchase date for vehicles over 15,000 miles & older than 2 years * Warranty Deductible: $0 * Vehicle History * Transferable Warranty * Includes Rental Car and Trip Interruption Reimbursement INFINITI of Boerne has been honored as one of the elite INFINITI retailers in the United States earning the Circle of Excellence Award. This prestigious award is granted to less than ten percent of all INFINITI retailers for their outstanding customer service and performance. View Our Story (https://youtu.be/pefb6aU3Hww) and see why INFINITI of Boerne stands out from the rest of the competition. Awards: * 2015 IIHS Top Safety Pick Visit INFINITI of Boerne today or contact us at 210-201-0311 to schedule a test drive. THIS CERTIFIED PRE-OWNED 2017 INFINITI QX30 IS EQUIPPED WITH NAVIGATION, WOOD PACKAGE. THIS QX30 IS A ONE-OWNER, NON-SMOKING VEHICLE AND HAS BEEN FOUND TO BE IN EXCELLENT CONDITION AFTER A THOROUGH 160-POINT INSPECTION BY ONE OF OUR INFINITI CERTIFIED TECHNICIANS! WE GUARANTEE EXCEPTIONAL SERVICE AND FREE CAR WASHES FOR LIFE! Acoustical Package, Aluminum Wheels, 18" x 7" Aluminum Alloy Wheels, 2.654 Axle Ratio, 4-Wheel Disc Brakes, ABS brakes, Air Conditioning, AM/FM radio: SiriusXM, Auto-dimming door mirrors, Auto-dimming Rear-View mirror, Automatic temperature control, Brake assist, Bumpers: body-color, CD player, Color Center Meter Display, Delay-off headlights, Driver door bin, Driver vanity mirror, Dual front impact airbags, Dual front side impact airbags, Electronic Stability Control, Four wheel independent suspension, Front & Rear Parking Sensors, Front anti-roll bar, Front Bucket Seats, Front Center Armrest, Front dual zone A/C, Front reading lights, Fully automatic headlights, Genuine Wood Trim on Center Stack & Door Handles, Heated door mirrors, Illuminated entry, INFINITI InTouch Navigation System, Knee airbag, Leather Shift Knob, Leather steering wheel, Low tire pressure warning, Navigation Package, Occupant sensing airbag, Outside temperature display, Overhead airbag, Overhead console, Panic alarm, Panoramic Moonroof, Passenger door bin, Passenger vanity mirror, Power door mirrors, Power steering, Power windows, Radio data system, Radio: Bose 10-Speaker Premium Audio System, Rear anti-roll bar, Rear fog lights, Rear window defroster, Rear window wiper, Remote keyless entry, Security system, Speed control, Speed-sensing steering, Split folding rear seat, Spoiler, Steering wheel mounted audio controls, Tachometer, Telescoping steering wheel, Tilt steering wheel, Traction control, Trip computer, Turn signal indicator mirrors, Variably intermittent wipers, Wood Package. CARFAX One-Owner. Clean CARFAX. Certified. INFINITI Certified Pre-Owned Details: * Roadside Assistance * Vehicle History * Warranty Deductible: $0 * Limited Warranty: 72 Month/Unlimited Mile (whichever comes first) Limited Warranty 72 months/Unlimited miles from original in-service date for vehicles over 15,000 miles & under 2 years old, 24 months/Unlimited miles from certified purchase date for vehicles over 15,000 miles & older than 2 years * 167 Point Inspection * Transferable Warranty * Includes Rental Car and Trip Interruption Reimbursement INFINITI of Boerne has been honored as one of the elite INFINITI retailers in the United States earning the Circle of Excellence Award. This prestigious award is granted to less than ten percent of all INFINITI retailers for their outstanding customer service and performance. View Our Story (https://youtu.be/pefb6aU3Hww) and see why INFINITI of Boerne stands out from the rest of the competition. Awards: * 2017 KBB.com 10 Best Luxury SUVs * 2017 KBB.com 10 Most Fun SUVs * 2017 KBB.com 10 Best Luxury Cars Under $35,000 Visit INFINITI of Boerne today or contact us at 210-201-0311 to schedule a test drive. 2-Way Driver's Seat Power Lumbar Support, ABS brakes, Alloy wheels, Bose Cabin Surround Sound System, Dual Occupant Memory System, Electronic Stability Control, Enhanced Intelligent Key Memory, Entry & Exit Assist, Front dual zone A/C, Heated door mirrors, Heated Front Seats, Heated front seats, Heated Steering Wheel, Illuminated entry, Low tire pressure warning, Outside Mirrors w/Reverse Tilt-Down Feature, Power Liftgate, Power moonroof, Premium Package, Radio: AM/FM/CD/DVD w/MP3 Playback Capability, Remote Engine Start, Remote keyless entry, Traction control. CARFAX One-Owner. Clean CARFAX. Certified. INFINITI Certified Pre-Owned Details: * Roadside Assistance * Transferable Warranty * 167 Point Inspection * Limited Warranty: 72 Month/Unlimited Mile (whichever comes first) Limited Warranty 72 months/Unlimited miles from original in-service date for vehicles over 15,000 miles & under 2 years old, 24 months/Unlimited miles from certified purchase date for vehicles over 15,000 miles & older than 2 years * Vehicle History * Includes Rental Car and Trip Interruption Reimbursement * Warranty Deductible: $0 INFINITI of Boerne has been honored as one of the elite INFINITI retailers in the United States earning the Circle of Excellence Award. This prestigious award is granted to less than ten percent of all INFINITI retailers for their outstanding customer service and performance. View Our Story (https://youtu.be/pefb6aU3Hww) and see why INFINITI of Boerne stands out from the rest of the competition. Awards: * 2015 IIHS Top Safety Pick Visit INFINITI of Boerne today or contact us at 210-201-0311 to schedule a test drive. Recent Arrival! THIS 2014 INFINITI QX80 IS EQUIPPED WITH DELUXE TECHNOLOGY, THEATER AND 22" WHEELS. IT IS A ONE-OWNER, NON-SMOKING VEHICLE AND HAS BEEN FOUND TO BE IN EXCELLENT CONDITION BY ONE OF OUR INFINITI CERTIFIED TECHNICIANS. WE GUARANTEE EXCEPTIONAL SERVICE AND FREE CAR WASHES FOR LIFE! Free Car Washes For Life!, 120V Power Outlet, 22" Wheel Package, 22" x 8.0" 9-Spoke Forged Aluminum Alloy Wheels, Adaptive Front Lighting System, Advanced Climate Control System, Backup Collision Intervention, Blind Spot Warning, Bose Cabin Surround Sound System, Climate-Controlled Front Seats, Deluxe Touring Package, Dual 7" Color Monitors, Front Pre-Crash Seatbelts, Headlight Washers, Heated 2nd-Row Seats, Hydraulic Body Motion Control System, Intelligent Brake Assist (IBA), Intelligent Cruise Control (Full-Speed Range), Mocha Burl Trim, Navigation System, Semi-Aniline Leather Seating, Technology Package, Theater Package, Wireless Headphones (2). CARFAX One-Owner. INFINITI of Boerne has been honored as one of the elite INFINITI retailers in the United States earning the Circle of Excellence Award. This prestigious award is granted to less than ten percent of all INFINITI retailers for their outstanding customer service and performance. View Our Story (https://youtu.be/pefb6aU3Hww) and see why INFINITI of Boerne stands out from the rest of the competition. Awards: * JD Power Initial Quality Study (IQS) Visit INFINITI of Boerne today or contact us at 210-201-0311 to schedule a test drive. 120V Power Outlet, 2-Way Driver's Seat Power Lumbar Support, ABS brakes, Alloy wheels, Around View Monitor w/Front & Rear Sonar System, Dual 7" Color Monitors, Dual Occupant Memory System, Electronic Stability Control, Enhanced Intelligent Key Memory, Entry & Exit Assist, Front dual zone A/C, Heated door mirrors, Heated Front Seats, Heated front seats, Heated Steering Wheel, Illuminated entry, INFINITI Navigation System, INFINITI Voice Recognition, Low tire pressure warning, Outside Mirrors w/Reverse Tilt-Down Feature, Power Liftgate, Power moonroof, Premium Package, Premium Plus Package, Radio: AM/FM/CD/DVD w/MP3 Playback Capability, Rain-Sensing Front Windshield Wipers, Remote Engine Start, Remote keyless entry, Single In-Dash CD Player, Theater Package, Traction control, Wireless Headphones (2). CARFAX One-Owner. Clean CARFAX. Certified. INFINITI Certified Pre-Owned Details: * Warranty Deductible: $0 * Includes Rental Car and Trip Interruption Reimbursement * 167 Point Inspection * Vehicle History * Transferable Warranty * Limited Warranty: 72 Month/Unlimited Mile (whichever comes first) Limited Warranty 72 months/Unlimited miles from original in-service date for vehicles over 15,000 miles & under 2 years old, 24 months/Unlimited miles from certified purchase date for vehicles over 15,000 miles & older than 2 years * Roadside Assistance INFINITI of Boerne has been honored as one of the elite INFINITI retailers in the United States earning the Circle of Excellence Award. This prestigious award is granted to less than ten percent of all INFINITI retailers for their outstanding customer service and performance. View Our Story (https://youtu.be/pefb6aU3Hww) and see why INFINITI of Boerne stands out from the rest of the competition. Awards: * 2015 IIHS Top Safety Pick Visit INFINITI of Boerne today or contact us at 210-201-0311 to schedule a test drive. 2-Way Driver's Seat Power Lumbar Support, ABS brakes, Alloy wheels, Around View Monitor w/Front & Rear Sonar System, Dual Occupant Memory System, Electronic Stability Control, Enhanced Intelligent Key Memory, Entry & Exit Assist, Front dual zone A/C, Heated door mirrors, Heated Front Seats, Heated front seats, Heated Steering Wheel, Illuminated entry, INFINITI Navigation System, INFINITI Voice Recognition, Low tire pressure warning, Outside Mirrors w/Reverse Tilt-Down Feature, Power Liftgate, Power moonroof, Premium Package, Premium Plus Package, Radio: AM/FM/CD/DVD w/MP3 Playback Capability, Rain-Sensing Front Windshield Wipers, Remote Engine Start, Remote keyless entry, Single In-Dash CD Player, Traction control. CARFAX One-Owner. Clean CARFAX. Certified. INFINITI Certified Pre-Owned Details: * Transferable Warranty * Limited Warranty: 72 Month/Unlimited Mile (whichever comes first) Limited Warranty 72 months/Unlimited miles from original in-service date for vehicles over 15,000 miles & under 2 years old, 24 months/Unlimited miles from certified purchase date for vehicles over 15,000 miles & older than 2 years * Includes Rental Car and Trip Interruption Reimbursement * Roadside Assistance * Warranty Deductible: $0 * 167 Point Inspection * Vehicle History INFINITI of Boerne has been honored as one of the elite INFINITI retailers in the United States earning the Circle of Excellence Award. This prestigious award is granted to less than ten percent of all INFINITI retailers for their outstanding customer service and performance. View Our Story (https://youtu.be/pefb6aU3Hww) and see why INFINITI of Boerne stands out from the rest of the competition. Awards: * 2015 IIHS Top Safety Pick Visit INFINITI of Boerne today or contact us at 210-201-0311 to schedule a test drive. ABS brakes, Alloy wheels, Electronic Stability Control, Front dual zone A/C, Heated door mirrors, Heated Front Bucket Seats, Heated front seats, Illuminated entry, Low tire pressure warning, Remote keyless entry, Traction control. CARFAX One-Owner. Clean CARFAX. Certified. INFINITI Certified Pre-Owned Details: * Transferable Warranty * Includes Rental Car and Trip Interruption Reimbursement * Roadside Assistance * Warranty Deductible: $0 * Limited Warranty: 72 Month/Unlimited Mile (whichever comes first) Limited Warranty 72 months/Unlimited miles from original in-service date for vehicles over 15,000 miles & under 2 years old, 24 months/Unlimited miles from certified purchase date for vehicles over 15,000 miles & older than 2 years * Vehicle History * 167 Point Inspection INFINITI of Boerne has been honored as one of the elite INFINITI retailers in the United States earning the Circle of Excellence Award. This prestigious award is granted to less than ten percent of all INFINITI retailers for their outstanding customer service and performance. View Our Story (https://youtu.be/pefb6aU3Hww) and see why INFINITI of Boerne stands out from the rest of the competition. Visit INFINITI of Boerne today or contact us at 210-201-0311 to schedule a test drive. 2-Way Driver's Seat Power Lumbar Support, ABS brakes, Active Trace Control, Alloy wheels, Around View Monitor w/Front & Rear Sonar System, Back-Up Collision Intervention (BCI), Blind Spot Warning System (BSW), Distance Control Assist, Driver Assistance Package, Dual Occupant Memory System, ECO Pedal, Electronic Stability Control, Enhanced Intelligent Key Memory, Entry & Exit Assist, Front & Rear Sonar System, Front dual zone A/C, Heated door mirrors, Heated Front Seats, Heated front seats, Heated Steering Wheel, Illuminated entry, INFINITI Navigation System, INFINITI Voice Recognition, Intelligent Brake Assist (IBA), Intelligent Cruise Control, Low tire pressure warning, Outside Mirrors w/Reverse Tilt-Down Feature, Power Liftgate, Power moonroof, Premium Package, Premium Plus Package, Radio: AM/FM/CD/DVD w/MP3 Playback Capability, Rain-Sensing Front Windshield Wipers, Remote Engine Start, Remote keyless entry, Single In-Dash CD Player, Traction control. CARFAX One-Owner. Clean CARFAX. Certified. INFINITI Certified Pre-Owned Details: * Warranty Deductible: $0 * Limited Warranty: 72 Month/Unlimited Mile (whichever comes first) Limited Warranty 72 months/Unlimited miles from original in-service date for vehicles over 15,000 miles & under 2 years old, 24 months/Unlimited miles from certified purchase date for vehicles over 15,000 miles & older than 2 years * Transferable Warranty * 167 Point Inspection * Vehicle History * Includes Rental Car and Trip Interruption Reimbursement * Roadside Assistance INFINITI of Boerne has been honored as one of the elite INFINITI retailers in the United States earning the Circle of Excellence Award. This prestigious award is granted to less than ten percent of all INFINITI retailers for their outstanding customer service and performance. View Our Story (https://youtu.be/pefb6aU3Hww) and see why INFINITI of Boerne stands out from the rest of the competition. Awards: * 2015 IIHS Top Safety Pick Visit INFINITI of Boerne today or contact us at 210-201-0311 to schedule a test drive. 120V Power Outlet, 20" Split 5-Spoke Aluminum-Alloy Wheels, 20" Wheel & Tire Package, 2-Way Driver's Seat Power Lumbar Support, ABS brakes, Active Trace Control, Advanced Climate Control System, Around View Monitor w/Front & Rear Sonar System, Back-Up Collision Intervention (BCI), Blind Spot Intervention (BSI), Blind Spot Warning System (BSW), Bose Cabin Surround Sound System, Climate-Controlled Front Seats, Deluxe Touring Package, Distance Control Assist, Driver Assistance Package, Dual 7" Color Monitors, Dual Occupant Memory System, ECO Pedal, Electronic Stability Control, Enhanced Intelligent Key Memory, Entry & Exit Assist, Front & Rear Sonar System, Front dual zone A/C, Front Pre-Crash Seatbelts, Heated 2nd-Row Seats, Heated door mirrors, Heated Front Seats, Heated front seats, Heated Steering Wheel, Illuminated entry, INFINITI Navigation System, INFINITI Voice Recognition, Intelligent Brake Assist (IBA), Intelligent Cruise Control, Lane Departure Prevention (LDP), Low tire pressure warning, Maple Accents Package, Maple Interior Accents, Navigation System, Outside Mirrors w/Reverse Tilt-Down Feature, Power Liftgate, Power moonroof, Power Return Third Row Seat Back, Premium Package, Premium Plus Package, Radio: AM/FM/CD/DVD w/MP3 Playback Capability, Rain-Sensing Front Windshield Wipers, Remote Engine Start, Remote keyless entry, Second & Third-Row Moonroof w/Power Rear Sunshade, Single In-Dash CD Player, Technology Package, Theater Package, Traction control, Wireless Headphones (2). CARFAX One-Owner. Clean CARFAX. Certified. INFINITI Certified Pre-Owned Details: * Transferable Warranty * Warranty Deductible: $0 * Roadside Assistance * Limited Warranty: 72 Month/Unlimited Mile (whichever comes first) Limited Warranty 72 months/Unlimited miles from original in-service date for vehicles over 15,000 miles & under 2 years old, 24 months/Unlimited miles from certified purchase date for vehicles over 15,000 miles & older than 2 years * Includes Rental Car and Trip Interruption Reimbursement * Vehicle History * 167 Point Inspection INFINITI of Boerne has been honored as one of the elite INFINITI retailers in the United States earning the Circle of Excellence Award. This prestigious award is granted to less than ten percent of all INFINITI retailers for their outstanding customer service and performance. View Our Story (https://youtu.be/pefb6aU3Hww) and see why INFINITI of Boerne stands out from the rest of the competition. Awards: * 2015 IIHS Top Safety Pick Visit INFINITI of Boerne today or contact us at 210-201-0311 to schedule a test drive. 2-Way Driver's Seat Power Lumbar Support, ABS brakes, Alloy wheels, Around View Monitor w/Front & Rear Sonar System, Dual Occupant Memory System, Electronic Stability Control, Enhanced Intelligent Key Memory, Entry & Exit Assist, Front dual zone A/C, Heated door mirrors, Heated Front Seats, Heated front seats, Heated Steering Wheel, Illuminated entry, INFINITI InTouch w/Navigation, Low tire pressure warning, Navigation System, Outside Mirrors w/Reverse Tilt-Down Feature, Power Liftgate, Power moonroof, Premium Package, Premium Plus Package, Radio: AM/FM/CD/DVD w/MP3 Playback Capability, Rain-Sensing Front Windshield Wipers, Remote Engine Start, Remote keyless entry, Single In-Dash CD Player, Traction control, Voice Recognition For Navigation. CARFAX One-Owner. Clean CARFAX. Certified. INFINITI Certified Pre-Owned Details: * Roadside Assistance * Limited Warranty: 72 Month/Unlimited Mile (whichever comes first) Limited Warranty 72 months/Unlimited miles from original in-service date for vehicles over 15,000 miles & under 2 years old, 24 months/Unlimited miles from certified purchase date for vehicles over 15,000 miles & older than 2 years * Transferable Warranty * 167 Point Inspection * Includes Rental Car and Trip Interruption Reimbursement * Vehicle History * Warranty Deductible: $0 INFINITI of Boerne has been honored as one of the elite INFINITI retailers in the United States earning the Circle of Excellence Award. This prestigious award is granted to less than ten percent of all INFINITI retailers for their outstanding customer service and performance. View Our Story (https://youtu.be/pefb6aU3Hww) and see why INFINITI of Boerne stands out from the rest of the competition. Awards: * 2017 IIHS Top Safety Pick * 2017 KBB.com 5-Year Cost to Own Awards Visit INFINITI of Boerne today or contact us at 210-201-0311 to schedule a test drive. 120V Power Outlet, 20" Split 5-Spoke Aluminum-Alloy Wheels, 20" Wheel & Tire Package, 2-Way Driver's Seat Power Lumbar Support, ABS brakes, Active Trace Control, Advanced Climate Control System, Around View Monitor w/Front & Rear Sonar System, Back-Up Collision Intervention (BCI), Blind Spot Intervention (BSI), Blind Spot Warning System (BSW), Bose Cabin Surround Sound System, Climate-Controlled Front Seats, Deluxe Touring Package, Distance Control Assist, Driver Assistance Package, Dual 7" Color Monitors, Dual Occupant Memory System, ECO Pedal, Electronic Stability Control, Enhanced Intelligent Key Memory, Entry & Exit Assist, Front & Rear Sonar System, Front dual zone A/C, Front Pre-Crash Seatbelts, Heated 2nd-Row Seats, Heated door mirrors, Heated Front Seats, Heated front seats, Heated Steering Wheel, Illuminated entry, INFINITI Navigation System, INFINITI Voice Recognition, Intelligent Brake Assist (IBA), Intelligent Cruise Control, Lane Departure Prevention (LDP), Low tire pressure warning, Maple Accents Package, Maple Interior Accents, Navigation System, Outside Mirrors w/Reverse Tilt-Down Feature, Power Liftgate, Power moonroof, Power Return Third Row Seat Back, Premium Package, Premium Plus Package, Radio: AM/FM/CD/DVD w/MP3 Playback Capability, Rain-Sensing Front Windshield Wipers, Remote Engine Start, Remote keyless entry, Second & Third-Row Moonroof w/Power Rear Sunshade, Single In-Dash CD Player, Technology Package, Theater Package, Traction control, Wireless Headphones (2). CARFAX One-Owner. Clean CARFAX. Certified. INFINITI Certified Pre-Owned Details: * Warranty Deductible: $0 * Roadside Assistance * Limited Warranty: 72 Month/Unlimited Mile (whichever comes first) Limited Warranty 72 months/Unlimited miles from original in-service date for vehicles over 15,000 miles & under 2 years old, 24 months/Unlimited miles from certified purchase date for vehicles over 15,000 miles & older than 2 years * Vehicle History * Includes Rental Car and Trip Interruption Reimbursement * 167 Point Inspection * Transferable Warranty INFINITI of Boerne has been honored as one of the elite INFINITI retailers in the United States earning the Circle of Excellence Award. This prestigious award is granted to less than ten percent of all INFINITI retailers for their outstanding customer service and performance. View Our Story (https://youtu.be/pefb6aU3Hww) and see why INFINITI of Boerne stands out from the rest of the competition. Awards: * 2015 IIHS Top Safety Pick Visit INFINITI of Boerne today or contact us at 210-201-0311 to schedule a test drive. 120V Power Outlet, 20" Split 5-Spoke Aluminum-Alloy Wheels, 20" Wheel & Tire Package, 2-Way Driver's Seat Power Lumbar Support, ABS brakes, Active Trace Control, Advanced Climate Control System, Around View Monitor w/Front & Rear Sonar System, Back-Up Collision Intervention (BCI), Blind Spot Intervention (BSI), Blind Spot Warning System (BSW), Bose Cabin Surround Sound System, Climate-Controlled Front Seats, Deluxe Touring Package, Distance Control Assist, Driver Assistance Package, Dual 7" Color Monitors, Dual Occupant Memory System, ECO Pedal, Electronic Stability Control, Enhanced Intelligent Key Memory, Entry & Exit Assist, Front & Rear Sonar System, Front dual zone A/C, Front Pre-Crash Seatbelts, Heated 2nd-Row Seats, Heated door mirrors, Heated Front Seats, Heated front seats, Heated Steering Wheel, Illuminated entry, INFINITI Navigation System, INFINITI Voice Recognition, Intelligent Brake Assist (IBA), Intelligent Cruise Control, Lane Departure Prevention (LDP), Low tire pressure warning, Maple Accents Package, Maple Interior Accents, Navigation System, Outside Mirrors w/Reverse Tilt-Down Feature, Power Liftgate, Power moonroof, Power Return Third Row Seat Back, Premium Package, Premium Plus Package, Radio: AM/FM/CD/DVD w/MP3 Playback Capability, Rain-Sensing Front Windshield Wipers, Remote Engine Start, Remote keyless entry, Second & Third-Row Moonroof w/Power Rear Sunshade, Single In-Dash CD Player, Technology Package, Theater Package, Traction control, Wireless Headphones (2). CARFAX One-Owner. Clean CARFAX. Certified. INFINITI Certified Pre-Owned Details: * Limited Warranty: 72 Month/Unlimited Mile (whichever comes first) Limited Warranty 72 months/Unlimited miles from original in-service date for vehicles over 15,000 miles & under 2 years old, 24 months/Unlimited miles from certified purchase date for vehicles over 15,000 miles & older than 2 years * Roadside Assistance * 167 Point Inspection * Includes Rental Car and Trip Interruption Reimbursement * Transferable Warranty * Warranty Deductible: $0 * Vehicle History INFINITI of Boerne has been honored as one of the elite INFINITI retailers in the United States earning the Circle of Excellence Award. This prestigious award is granted to less than ten percent of all INFINITI retailers for their outstanding customer service and performance. View Our Story (https://youtu.be/pefb6aU3Hww) and see why INFINITI of Boerne stands out from the rest of the competition. Awards: * 2015 IIHS Top Safety Pick Visit INFINITI of Boerne today or contact us at 210-201-0311 to schedule a test drive. New Price! THIS CERTIFIED PRE-OWNED 2017 INFINITI QX60 IS A FULLY LOADED DELUXE TECHNOLOGY, ONE-OWNER, NON-SMOKING VEHICLE AND HAS BEEN FOUND TO BE IN EXCELLENT CONDITION AFTER A THOROUGH 160-POINT INSPECTION BY ONE OF OUR INFINITI CERTIFIED TECHNICIANS! WE GUARANTEE EXCEPTIONAL SERVICE AND FREE CAR WASHES FOR LIFE! 20" Wheel & Tire Package, 2-Way Driver's Seat Power Lumbar Support, ABS brakes, Active Trace Control, Advanced Climate Control System, Around View Monitor w/Front & Rear Sonar System, Back-Up Collision Intervention (BCI), Blind Spot Intervention System (BSI), Blind Spot Warning System (BSW), BOSE 13-speaker Premium Audio System including Radio: AM/FM/CD/DVD w/MP3 Playback Capability, Bose Cabin Surround Sound System, Climate-Controlled Front Seats, Deluxe Technology Package, Distance Control Assist, Driver Assistance Package, Dual Occupant Memory System, ECO Pedal, Electronic Stability Control, Enhanced Intelligent Key Memory, Entry & Exit Assist, Forward Emergency Braking (FEB), Front and Rear Sonar Sensors, Front dual zone A/C, Front Pre-Crash Seatbelts, Heated 2nd-Row Seats, Heated door mirrors, Heated Front Seats, Heated front seats, Heated Steering Wheel, Illuminated entry, Illuminated Kick Plates, INFINITI Navigation System including XM NavTraffic and NavWeather with real time information, INFINITI Voice Recognition, Intelligent Cruise Control, Lane Departure Prevention (LDP), Low tire pressure warning, Maple Interior Accents, Navigation System, Outside Mirrors w/Reverse Tilt-Down Feature, Power Liftgate, Power moonroof, Power Return Third Row Seat Back, Predictive Forward Collision Warning (PFCW), Predictive Forward Emergency Braking (PFEB), Premium Package, Premium Plus Package, Rain-Sensing Front Windshield Wipers, Rear Bumper Protector & Roof Rails, Remote Engine Start, Remote keyless entry, Second & Third-Row Moonroof w/Power Rear Sunshade, Single In-Dash CD Player, Traction control, Wheels: 20" 15-Spoke Aluminum-Alloy. CARFAX One-Owner. Clean CARFAX. Certified. INFINITI Certified Pre-Owned Details: * Vehicle History * Warranty Deductible: $0 * Roadside Assistance * Includes Rental Car and Trip Interruption Reimbursement * Limited Warranty: 72 Month/Unlimited Mile (whichever comes first) Limited Warranty 72 months/Unlimited miles from original in-service date for vehicles over 15,000 miles & under 2 years old, 24 months/Unlimited miles from certified purchase date for vehicles over 15,000 miles & older than 2 years * 167 Point Inspection * Transferable Warranty INFINITI of Boerne has been honored as one of the elite INFINITI retailers in the United States earning the Circle of Excellence Award. This prestigious award is granted to less than ten percent of all INFINITI retailers for their outstanding customer service and performance. View Our Story (https://youtu.be/pefb6aU3Hww) and see why INFINITI of Boerne stands out from the rest of the competition. Awards: * 2016 IIHS Top Safety Pick+ Visit INFINITI of Boerne today or contact us at 210-201-0311 to schedule a test drive. 2-Way Driver's Seat Power Lumbar Support, ABS brakes, Active Trace Control, Alloy wheels, Around View Monitor w/Front & Rear Sonar System, Back-Up Collision Intervention (BCI), Blind Spot Warning System (BSW), BOSE 13-speaker Premium Audio System including Radio: AM/FM/CD/DVD w/MP3 Playback Capability, Distance Control Assist, Driver Assistance Package, Dual Occupant Memory System, ECO Pedal, Electronic Stability Control, Enhanced Intelligent Key Memory, Entry & Exit Assist, Front and Rear Sonar Sensors, Front dual zone A/C, Heated door mirrors, Heated Front Seats, Heated front seats, Heated Steering Wheel, Illuminated entry, Illuminated Kick Plates, INFINITI Navigation System including XM NavTraffic and NavWeather with real time information, INFINITI Voice Recognition, Intelligent Cruise Control, Low tire pressure warning, Outside Mirrors w/Reverse Tilt-Down Feature, Power Liftgate, Power moonroof, Premium Package, Premium Plus Package, Rain-Sensing Front Windshield Wipers, Rear Bumper Protector & Roof Rails, Remote Engine Start, Remote keyless entry, Single In-Dash CD Player, Traction control. CARFAX One-Owner. Certified. INFINITI Certified Pre-Owned Details: * Limited Warranty: 72 Month/Unlimited Mile (whichever comes first) Limited Warranty 72 months/Unlimited miles from original in-service date for vehicles over 15,000 miles & under 2 years old, 24 months/Unlimited miles from certified purchase date for vehicles over 15,000 miles & older than 2 years * Includes Rental Car and Trip Interruption Reimbursement * Vehicle History * Roadside Assistance * 167 Point Inspection * Transferable Warranty * Warranty Deductible: $0 INFINITI of Boerne has been honored as one of the elite INFINITI retailers in the United States earning the Circle of Excellence Award. This prestigious award is granted to less than ten percent of all INFINITI retailers for their outstanding customer service and performance. View Our Story (https://youtu.be/pefb6aU3Hww) and see why INFINITI of Boerne stands out from the rest of the competition. Awards: * 2016 IIHS Top Safety Pick+ Visit INFINITI of Boerne today or contact us at 210-201-0311 to schedule a test drive. 13 Speakers, 2.94 Axle Ratio, 22" Wheel Package, 3rd row seats: split-bench, 4-Wheel Disc Brakes, ABS brakes, Air Conditioning, AM/FM radio: SiriusXM, Anti-whiplash front head restraints, Auto High-beam Headlights, Auto tilt-away steering wheel, Auto-dimming door mirrors, Auto-dimming Rear-View mirror, Auto-leveling suspension, Automatic temperature control, Backup Collision Intervention (BCI), Blind Spot Warning, Bose Premium Sound System, Brake assist, Bumpers: body-color, CD player, Delay-off headlights, Driver door bin, Driver vanity mirror, Driver's Assistance Package, Dual front impact airbags, Dual front side impact airbags, Electronic Stability Control, Emergency communication system: INFINITI Connection, Four wheel independent suspension, Front anti-roll bar, Front Bucket Seats, Front Center Armrest, Front dual zone A/C, Front fog lights, Front reading lights, Fully automatic headlights, Garage door transmitter: HomeLink, Genuine wood console insert, Genuine wood dashboard insert, Genuine wood door panel insert, Heated door mirrors, Heated Front Bucket Seats, Heated front seats, Heated steering wheel, Illuminated entry, Intelligent Cruise Control (Full-Speed Range), Leather Shift Knob, Leather steering wheel, Leather-Appointed Seats w/Mocha Burl Trim, Low tire pressure warning, Memory seat, Navigation System, Occupant sensing airbag, Outside temperature display, Overhead airbag, Overhead console, Panic alarm, Passenger door bin, Passenger vanity mirror, Power door mirrors, Power driver seat, Power Liftgate, Power moonroof, Power passenger seat, Power steering, Power windows, Radio data system, Rain sensing wipers, Rear air conditioning, Rear anti-roll bar, Rear audio controls, Rear reading lights, Rear seat center armrest, Rear window defroster, Rear window wiper, Reclining 3rd row seat, Remote keyless entry, Roof rack: rails only, Security system, Speed control, Speed-sensing steering, Split folding rear seat, Spoiler, Steering wheel memory, Steering wheel mounted audio controls, Tachometer, Telescoping steering wheel, Tilt steering wheel, Traction control, Trip computer, Turn signal indicator mirrors, Variably intermittent wipers, Voltmeter, Wheels: 22" x 8.0" 14-Spoke Forged Aluminum-Alloy. Priced below KBB Fair Purchase Price! INFINITI of Boerne has been honored as one of the elite INFINITI retailers in the United States earning the Circle of Excellence Award. This prestigious award is granted to less than ten percent of all INFINITI retailers for their outstanding customer service and performance. View Our Story (https://youtu.be/pefb6aU3Hww) and see why INFINITI of Boerne stands out from the rest of the competition. Visit INFINITI of Boerne today or contact us at 210-201-0311 to schedule a test drive. 120V Power Outlet, 13 Speakers, 22" Wheel Package, ABS brakes, Backup Collision Intervention (BCI), Blind Spot Warning, Bose Premium Sound System, Brake assist, Driver's Assistance Package, Dual 7" Color Monitors, Electronic Stability Control, Front dual zone A/C, Heated 2nd-Row Seats, Heated door mirrors, Heated Front Bucket Seats, Heated front seats, Illuminated entry, Intelligent Cruise Control (Full-Speed Range), Low tire pressure warning, Navigation System, Power Liftgate, Power moonroof, Rear air conditioning, Remote keyless entry, Theater Package, Traction control, Wheels: 22" x 8.0" 14-Spoke Forged Aluminum-Alloy, Wireless Headphones (2). Priced below KBB Fair Purchase Price! Clean CARFAX. INFINITI of Boerne has been honored as one of the elite INFINITI retailers in the United States earning the Circle of Excellence Award. This prestigious award is granted to less than ten percent of all INFINITI retailers for their outstanding customer service and performance. View Our Story (https://youtu.be/pefb6aU3Hww) and see why INFINITI of Boerne stands out from the rest of the competition. Visit INFINITI of Boerne today or contact us at 210-201-0311 to schedule a test drive. Free Car Washes For Life!, Two Sets of Keys, 6 Speakers, AM/FM/CD Audio System, Blind spot sensor: Blind Spot Warning warning, Front Bucket Seats, Heated door mirrors, Heated Front Seats, Power Liftgate, Power moonroof, Wheels: 18" Triple 5-Spoke Aluminum-Alloy. Clean CARFAX. Certified. INFINITI Certified Pre-Owned Details: * Limited Warranty: 72 Month/Unlimited Mile (whichever comes first) Limited Warranty 72 months/Unlimited miles from original in-service date for vehicles over 15,000 miles & under 2 years old, 24 months/Unlimited miles from certified purchase date for vehicles over 15,000 miles & older than 2 years * Includes Rental Car and Trip Interruption Reimbursement * Roadside Assistance * 167 Point Inspection * Transferable Warranty * Vehicle History * Warranty Deductible: $0 INFINITI of Boerne has been honored as one of the elite INFINITI retailers in the United States earning the Circle of Excellence Award. This prestigious award is granted to less than ten percent of all INFINITI retailers for their outstanding customer service and performance. View Our Story (https://youtu.be/pefb6aU3Hww) and see why INFINITI of Boerne stands out from the rest of the competition. Visit INFINITI of Boerne today or contact us at 210-201-0311 to schedule a test drive. 22" Wheel Package, ABS brakes, Backup Collision Intervention (BCI), Blind Spot Warning, Driver's Assistance Package, Electronic Stability Control, Front dual zone A/C, Heated door mirrors, Heated Front Bucket Seats, Heated front seats, Illuminated entry, Intelligent Brake Assist (IBA), Intelligent Cruise Control (Full-Speed Range), Low tire pressure warning, Navigation System, Power Liftgate, Power moonroof, Remote keyless entry, Traction control, Wheels: 22" x 8.0" 14-Spoke Forged Aluminum-Alloy. Priced below KBB Fair Purchase Price! CARFAX One-Owner. Clean CARFAX. Certified. INFINITI Certified Pre-Owned Details: * Roadside Assistance * Vehicle History * Includes Rental Car and Trip Interruption Reimbursement * Transferable Warranty * Limited Warranty: 72 Month/Unlimited Mile (whichever comes first) Limited Warranty 72 months/Unlimited miles from original in-service date for vehicles over 15,000 miles & under 2 years old, 24 months/Unlimited miles from certified purchase date for vehicles over 15,000 miles & older than 2 years * Warranty Deductible: $0 * 167 Point Inspection INFINITI of Boerne has been honored as one of the elite INFINITI retailers in the United States earning the Circle of Excellence Award. This prestigious award is granted to less than ten percent of all INFINITI retailers for their outstanding customer service and performance. View Our Story (https://youtu.be/pefb6aU3Hww) and see why INFINITI of Boerne stands out from the rest of the competition. Visit INFINITI of Boerne today or contact us at 210-201-0311 to schedule a test drive. Manufacturer’s Suggested Retail Price. Excludes options; taxes; title; registration; delivery, processing and handling fee; dealer charges. Dealer sets actual selling price. While great effort is made to ensure the accuracy of the information on this site, errors do occur so please verify information with a customer service rep. This is easily done by calling us at (210) 477-1775 or by visiting us at the dealership. **Lease payments calculated based off of a 39 month lease with 10,000 miles per year, 10% of the MSRP is down payment. No security deposit required, with approved credit. Extra charges may apply at lease termination. Plus first month’s payment, $795 acquisition fee, $150 dealer fee, $208.75 electronic title, tax, transfer tag and state fees with approved credit through INFINITI Financial Services. See dealer for complete details. Expires at month end. We appreciate your interest in our inventory, and apologize we do not have model details displaying on the website at this time. Please fill the form out below and our team will quickly respond, or, please call us at (210) 477-1775 for more information. Whether you’re hoping to find a used QX80 or a pre-owned crossover such as the QX60, there’s sure to be a model in our inventory that suits both your preferences and your budget. Not sure if an SUV is right for you? We have plenty of other pre-owned options for sale, including certified pre-owned vehicles and a selection of used cars priced under $10k. Once you’ve found a model that you like, you can contact us to set up a test drive! We can’t wait to help you hit the San Antonio streets in a vehicle you’ll love.